There’s a smell in the air here that I have t smelled anywhere else- maybe melting permafrost or a landscape racing to breathe in every minute of endless summer sun. It snaps my attention to the present, to this place, to the fact that the very best thing I’ve done, the very best moment yet is this one right now. “Big dreams.” I reply quickly. For a while there at my desk I could no longer imagine a better life than racing between passion and profession, scrambling, scrimping, just getting enough of each to resemble a commitment, but never reaping the rewards of real dedication. Releasing it all, the options loom large and the big dreams for my life flood back in. It’s all on the table again, rather than the slim possibilities afforded by a desk job I fell into and existed on because someone else offered it to me. Alaska is a big land, with ample space for dreaming- I hope to have a clearer picture of what exactly I’ve been dreaming when I get off the glacier in 15 days. The blog will be quiet for a while as it’s not possible to update from the glacier. More photos and adventure when I fly out around June 10. 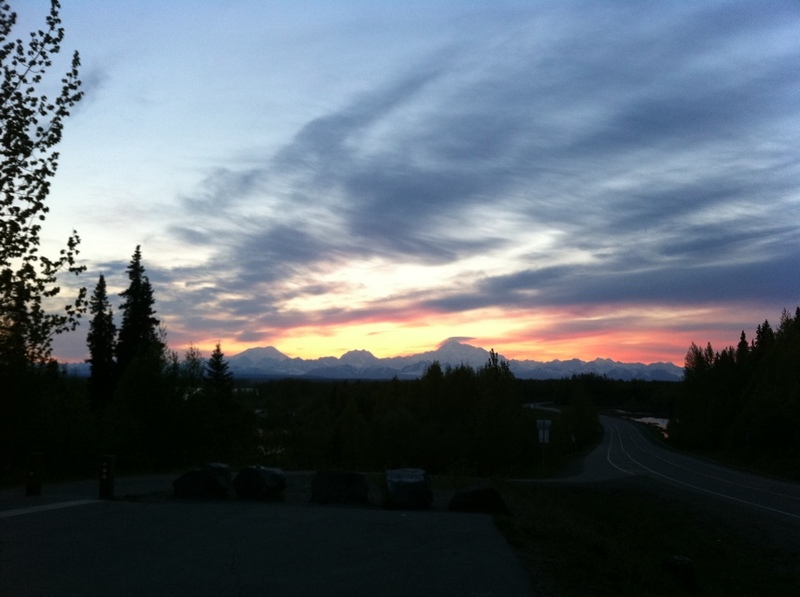 The big 3 at bedtime (11:30pm)- Mt Foraker, Hunter, and Denali. May they prompt appropriate dreams tonight. This entry was posted in Alpine Climbing, Philosophy, Traveling on May 26, 2011 by sticker1.